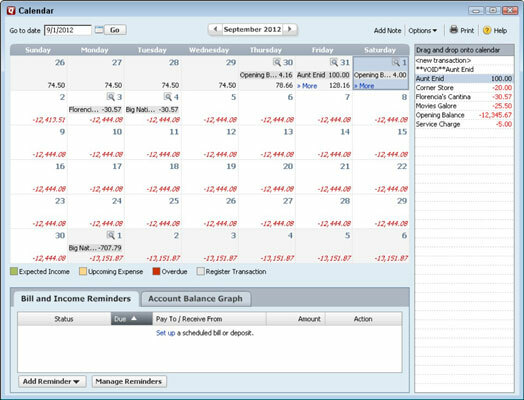 You can schedule income and transfer reminders in Quicken 2012. If you click the Add Reminder button, shown in the lower left-hand corner of the Calendar window, Quicken actually displays a menu of three commands: Bill Reminder, Income Reminder, and Transfer Reminder. You can use the same process as for bill reminders, using the Bill Reminder command, to get Quicken to remind you of income and transfers. You can use the Income Reminder and Transfer Reminder commands in the same basic way as you use the Bill Reminder command. The Income Reminder command lets you schedule reminders to record recurring income or deposit transactions such as from a regular payroll check. The Transfer Reminder command lets you schedule reminders to record recurring transfers such as mortgage payments from your checking account.